When you send product models to Yandex.Market, each of them is assigned to either a category with product profiles, or a category that doesn't have product profiles. 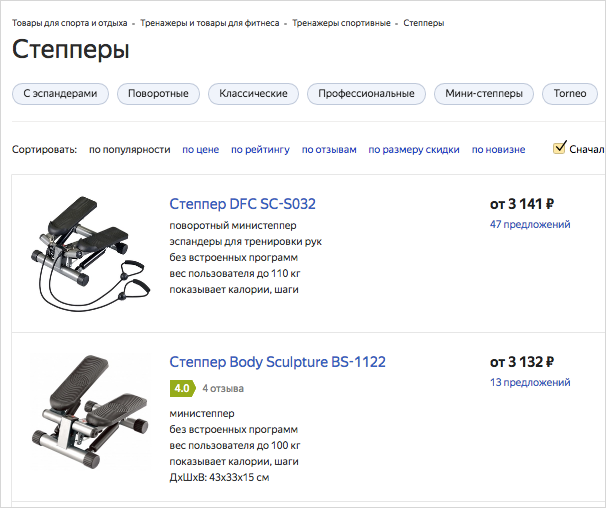 A Yandex.Market category page lists products from different brands that are related to this category. The category is chosen by the user, either via the catalog or the search bar. You can improve the position of your models that are in a category with product profiles. To do this, go to the category page in Yandex.Market. A better position means that models for your brand will be shown higher than other models, so more users see them. To improve the position of models, set bids for them. A bid is the amount you are willing per pay per click on your product model on the category page. The higher the bid, the higher the position of the model. Yandex.Market updates the positions of product models on the category page within two to four hours after you set bids. Go to the Товары(Products) page and find the desired items by name, category, or price. Set the bid amount in Yandex units for a specific listing in Новая ставка(New bid). One Yandex unit is equal to 30 rubles. Xis a number from 0 to 84 (for example: “1”). Y is a number from 0 to 99. You must include “0” before a single digit (for example: “07”). An example of a correctly specified bid is “1.07”. Click Сохранить(Save) above the list of products. Spending on bids for product models (the Расходы(Spending) chart). The number of clicks per product model (the Клики(Clicks) chart). Positions of product models on the Yandex.Market category page (the Позиция в каталоге(Placement in the catalog) chart). Each of the charts shows the overall data for all the product models that belong to your most popular category. You can view spending data for individual categories. To do this, click the Расходы(Spending) link and enter the category name in Фильтр по категориям(Filter by category). You can view data for clicks and positions for each product model or category. To do this, click Клики(Clicks) (Позиция в каталоге(Position in catalog)) and enter the model name (or category) in Фильтр по модели(Filter by model) (Фильтр по категории(Filter by category)).